Add pure elegance to your event! 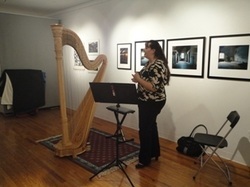 I play both Classical and Celtic harp and have an extensive repertoire that ranges from Classical, Celtic, Historical, Pop and International. Available for Weddings, Cocktail Hours, Background Music and many other venues. I am an avid admirer and player of Classical, Celtic and International music. Besides providing music for weddings and cocktail hours I also present concerts, tutorials, and presentations every year. Since 2006 I have been a presenter for Manchester Middle School’s annual Stand By Me Day that promotes the belief in following dreams and not getting involved in drugs and alcohol.